* Added sound effects courtesy of my 2-year old daughter. * Triple-tap to open a preference pane with settings for draw speed and turning sounds on and off. * Enabled drag gestures, so it is more useful now without an iCade (although I don’t know why you would use it without one). 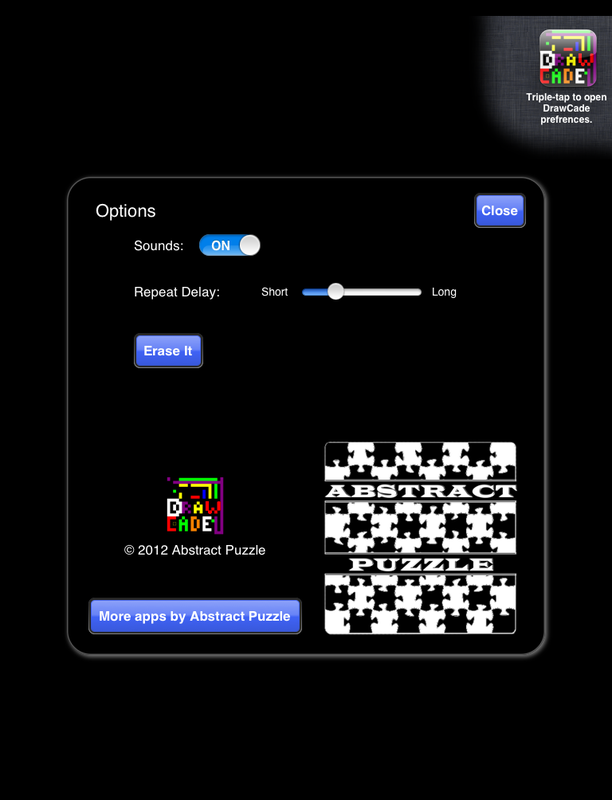 * The preferences pane also has a button to “erase it to black”, as well as a way to see more apps by Abstract Puzzle. This update was “inspired” by the fact that DrawCade probably gets more downloads per day (on average) than all my other apps. (It’s free, but that was true even when ActionChess was free too.) I wanted some soft cross-app-promotion in there, so I added a preference pane. While I was at it, I figured I should enable drag-to-draw, since my one negative review is about how the iCade is pretty much required to use the app. That’s no longer true, but I don’t know why you would use your fingers to draw with this when there are SO MANY other absolutely great drawing apps out there for the iPad. 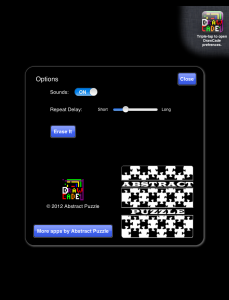 I spent yesterday morning re-writing the drawing to use my GGM (Generic Game Model) classes, and then the afternoon adding the preference pane with the buttons to view AbstractPuzzle.com and all my other apps in the app store. I had one really great preference item, repeat rate for the drawing (this was absolutely needed), but was struggling to think of anything else to put on there. I decided sort of late-afternoon to add some sound-effects. This was an idea I had when originally making the app, that the color buttons could also speak the name of the color as you pressed them. I figured it’s mildly educational. Then I had to pick up Colleen (my 2-year old daughter) from daycare. I ended up recording her playing with the app, and prompted her to say all the colors. Now I think the sound effects steal the show. Just listen to her saying Abstract Puzzle. Fun statistic: DrawCade had 45 downloads on Xmas day. iCade for christmas anyone? For The Win is out now! 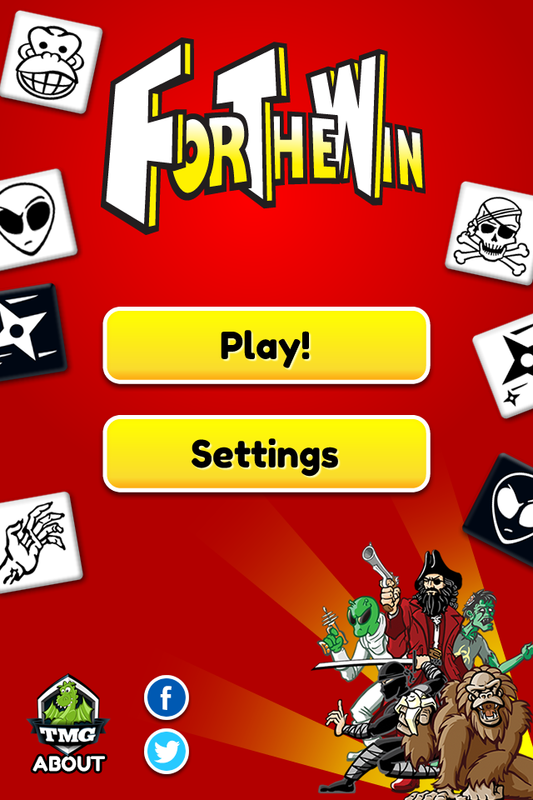 For The Win is out now and on sale at launch for only $.99 in the App store! For The Win is probably the most ambitious game project I’ve ever worked on, and represents months of hard work. Surprisingly, I’m not even sick of playing the game, and supporting the project means there is a better chance that I’ll be able to add asynchronous multiplayer (and a universal version) in an update in the near future. 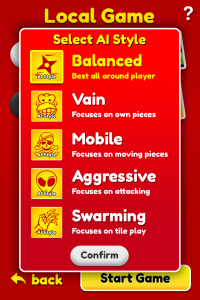 The game is already packed with features, including five different AI personalities, with three levels of difficulty each, GameCenter leaderboards for number of games played and won against each AI difficulty. You can quit and resume your game at any time, (great for pass-and play games), and it’s easy to name the players and customize their colors and avatars. I think it’s well worth a buck, so go download For The Win now! 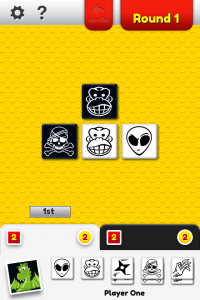 * new TAP control scheme – Tap instead of drag to place the bottom row. Hopefully this clears up the confusion about how to use the menu. Can be used in-game also. A friend of mine just picked up a new iPad, and he’s totally new to the world of iOS gaming. He wanted some recommendations, and I spent some time coming up with a list of what I’m playing regularly. Keep in mind these are all iPad or Universal games. (The list would be different for my iPhone.) Also, it’s clear my tastes are pretty short-attention-span. I have some longer-form games on my iPad, but I almost never sit down to play them. – PunchQuest – really fun game in the “endless runner” vein, I think they call it an “endless puncher”. You should check out Spaceteam, because it’s such a neat concept (and is free), but keep in mind that it’s multiplayer (local, real-time) only. Super fun even if there are only two of you, but it plays up to 4. Let me know if you have your own list how it differs from mine! So the “big” freelance project I’ve been working on part-time for the last five months or so was submitted to apple last Friday. It’s public knowledge that I’ve been working on it, but I wasn’t sure if I could talk about it until yesterday. The game is played by placing tiles from your pool of five different types (Alien, Monkey, Ninja, Pirate, Zombie — everyone has two of each) next to each other on the gameboard until someone has all five types of their color connected. The difficulty comes in that you can’t immediately place next to your existing tiles, and have to manipulate them into position by either moving them, or using each tile’s unique special ability. As you can see, the game really has a really great look and feel to it. 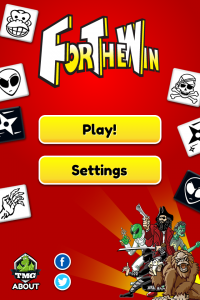 The app was designed by Luis Francisco Baroni Coutinho, who has worked on art and graphic design for an absolutely ridiculous number of board games in the past. He took the game’s original character artwork (by Eric J. Carter), and designed basically everything else needed for the iPhone version. The “client” for this project was Tasty Minstrel Games, and if there is one thing Michael Mindes did exceptionally well on this project, it was bring together a great team. The leader of that team was Brad Cummings, (of iOSBoardGames.com fame), and it has really been a pleasure to work with Brad, as he just really has his finger on the pulse of this weird little sub-niche that is iOS board games. He did all the early UX design for the app, as well as keep track of everyone’s tasks and all that other lovely stuff that a good project manager does. 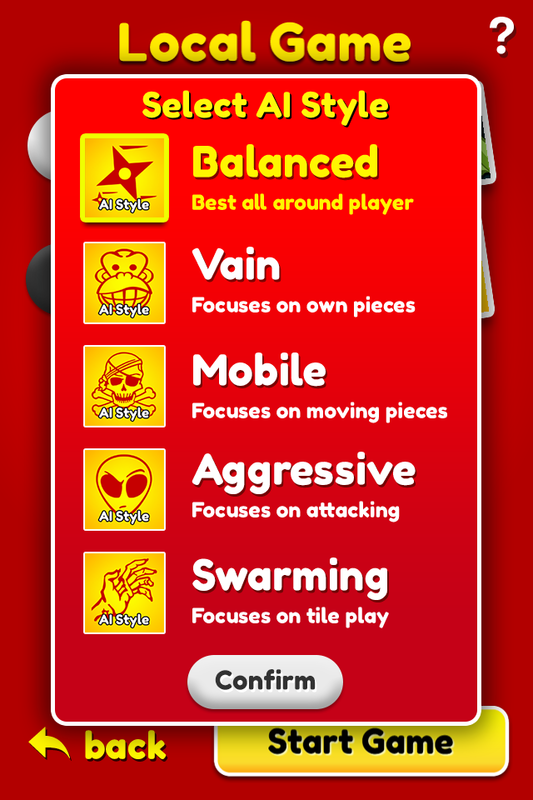 The app also features five different AI personality types, with three different difficulty settings for each. One of the biggest technical challenges (and most rewarding aspects) of the game’s development was working with AI programmer Tysen Streib, whose work was so good that most of the changes we had him make were to make it easier to win against the AI on easy difficulty. I didn’t work closely with him, but it’s worth giving a shout-out (since it appears that’s what this post has become) to the game’s original designer, Michael Eskue. I actually backed the board game on Kickstarter way back before I had even an inkling that I would be working on this project. Coincidentally, I got my Kickstarter reward copy in the mail about the same time I got started on development. Anyway, the game has real hidden depth and strategy. It can be a difficult one to wrap your head around at first, (and that may be the biggest challenge to this app’s success) but I genuinely think it can be rewarding to learn and play. 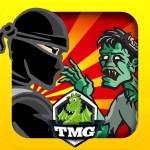 I will post again when it hits the app store.